Initial contributors to our survey are helping us to start to gather an eye-opening understanding of the current gender diversity landscape in financial services. They have highlighted the ‘laddish’, ‘politically incorrect’ culture within their firms, told us that they don’t feel that gender diversity is a priority within the business – or within recruitment practices – and that they have indeed felt disadvantaged in the workplace because of their gender. It has been identified that the country’s largest and most influential banks and financial institutions aren’t encouraging or supporting women to reach their full potential – we were even told that ‘women are treated badly.’ This new data allows to identify how and why these firms aren’t working for women, and help them to catch up. But it’s not all bad. A minority of women who have already taken part in the survey told us that their firms are doing everything they can to prioritise gender diversity and provide a variety of schemes and programmes with the sole purpose of developing and progressing women’s careers in financial services, and are already positioned as Leading Firms. We need to hear from the women who are working at these firms. We would love to hear about your positive experiences because we know that progress has and is being made. We are looking for an accurate representation of gender diversity practices to gain a true understanding of what it’s really like to be a woman in financial services – and so we need your help. Does your firm enable you to fulfil your ambitions? Are you in a position to reach your full potential at work? Your responses help us to ensure that we are working with leading firms – firms ready and willing to work for women – by having your say. 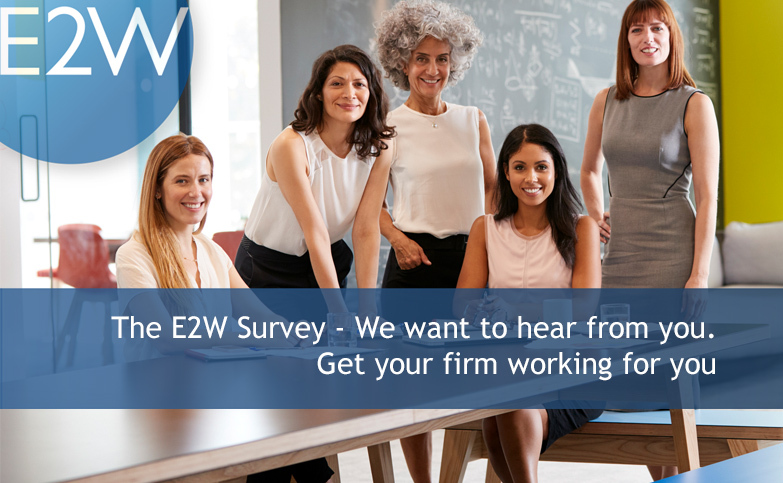 Share your experiences with us and we’ll identify your firm’s gender diversity position against best practice using E2W’s established pillars of diversity. It’s important that we are able to accurately represent the challenges women are facing to policy makers in government when we are called upon to do so, so share your experiences with us and help us to turn the dial. With these survey results we are more motivated for change than ever, but we can’t do it without you. Mobile and Tablet Users - click here to take the survey.